This has been a big week for the McClannons! On Wednesday, Whitney and I headed to the Social Security office to get our names officially changed! She got married a couple months before me, so she needed to get her name change going, too. I’m trying to make sure my new name is ready for the new school year so kids are slightly less confused – but I’m sure they’ll be calling me Ms. Weaver for a while, anyway! Today, I am going to try to go to the DMV for a new license…but if the lines are as bad as they are saying they are this summer, I may just have to wait on that. But the biggest news is that we went to the bank this week and got pre approved for a home loan! So we are starting the process to become home owners and hopefully soon our three little blonde monsters will have a fenced in back yard to call their own! Scary but very exciting. I’ll keep you posted! Last night, Andrew and I went to the Dierks Bentley concert with Brothers Osborne and LANco! One of my really dear friends Dymphna got us tickets as our gift at my bridal shower, and it was such an awesome idea! We went to the pub to eat first, since that’s how I know Dymphna, so we got to see her and hang out before heading to the concert. It was so much fun and nice to do something fun after all the craziness of wedding planning and moving! I made this Romano chicken with lemon garlic pasta for the first meal as a married couple in our apartment! (We keep saying, “this is the first time we’re doing xyz as a married couple!” Nerds.) The recipe was delicious and I will definitely be making it again! I followed it exactly but doubled the chicken part – I ended up with a ton of leftover parmesan cheese that I had to throw away because of the raw chicken, which is a tragedy. But other than that, it was delectable and easy to make, and Andrew loved it! I also found this recipe and made a batch of chocolate chip cookies – we used this option to make two deep dish chocolate chip cookies with some of the dough, and made our first batch of homemade vanilla ice cream in our ice cream maker from my sister! It was so fun, and, you know…totally healthy? The cookies are the best recipe I have found! Sooooo tasty. We used regular semi-sweet chocolate chips instead of cutting up dark chocolate chunks, and instead of rolling it into a log and slicing it, we just did it like a drop batter and used the spoon to scoop out cookies for the pan, but other than that, we kept the recipe the same! Oh – we did use a bourbon vanilla extract instead of regular vanilla extract. It just sounded like the right thing to do! In other news, I have absolutely lived in these shorts from Express all summer long. Read the reviews and BELIEVE THEM. The best pair of shorts I have ever put on. They are on sale and out of a bunch of sizes, but I’m linking in case they re-stock! I also bought this one piece from aerie and CANNOT say enough wonderful flattering things about it. It looks so good and feels so comfortable, and has just the right amount of sass to not feel like a “mom” suit. I got it in the olive green color. I feel so confident in it which is a HUGE win for me. I ordered it in the long torso because I realized for the first time that that is even a thing and that I need a longer swimsuit to fit me right. GAME CHANGER. And it’s currently on sale! 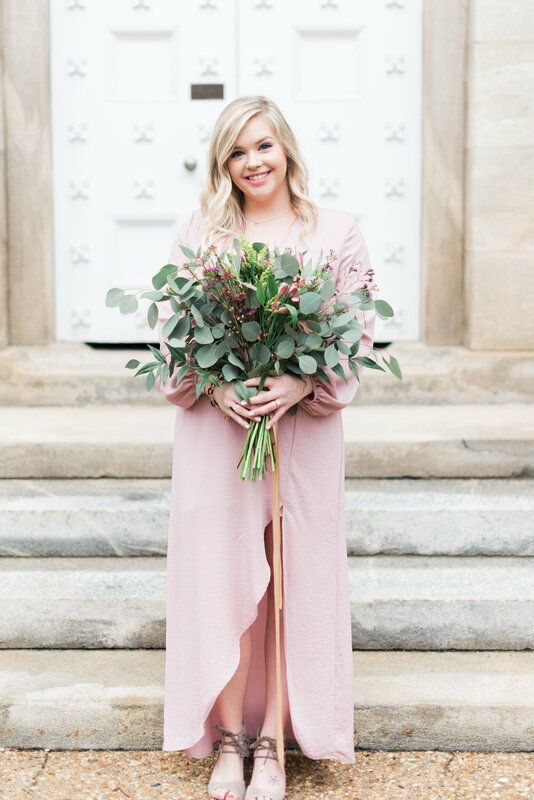 Other than that, I haven’t been too focused on new products or makeup this summer since I had our wedding coming up and I have such finicky skin – but I did get on a new skincare routine from my dermatologist and it has completely changed my skin for the better. I feel so much better and have hardly worn any makeup this summer because I haven’t felt the need to! I have been using the Aveeno clear complexion foaming face wash in the morning, a sulfur prescription face wash at night that has been a life saver, and then the Ceravé a.m. moisturizer, well, in the a.m., and then the p.m. moisturizer at night, which I LOVE. I also have two other prescriptions of creams, but it has been nice after trying so many high end “miracle” products that didn’t work for me to just go back to the basics and have success with these gentle, tried and true products. One of my best friends Lindsey, who is a licensed esthetician, also got me this Sorella Apothecary Rosehip warming face mask and All Night Elixir, which have been so nice to incorporate in the mix and don’t irritate my skin or cause breakouts. She is just the absolute best, a treat and a half, and you can check her out at Donna Lane Day Spa in Pinehurst! I am always looking for new products to try out and write about, and I’ve mentioned several times that I love to support local/small businesses. 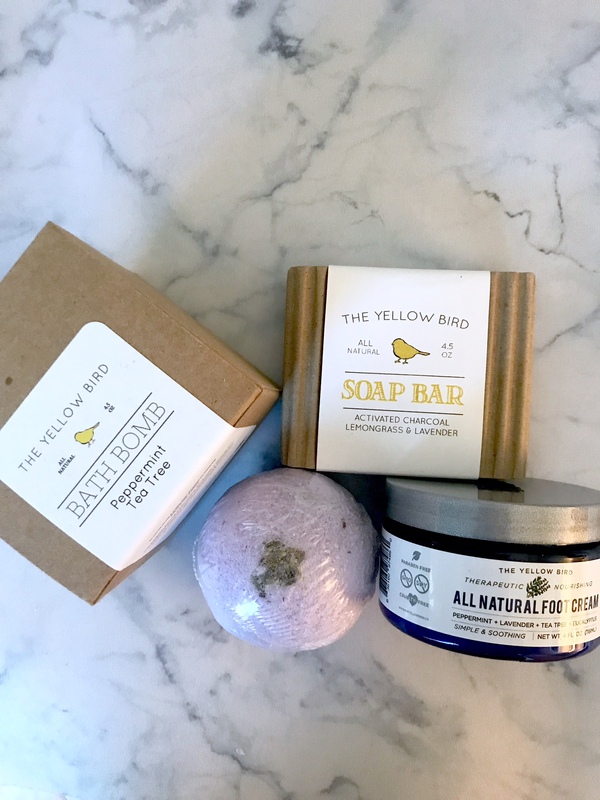 Whitney is always thinking of ideas for me, and a while back she had told me about The Yellow Bird and how she had met the owner at one of her networking meetings for local creatives and business owners. I started following on Instagram and got a feel for the products and the vibes from the company. 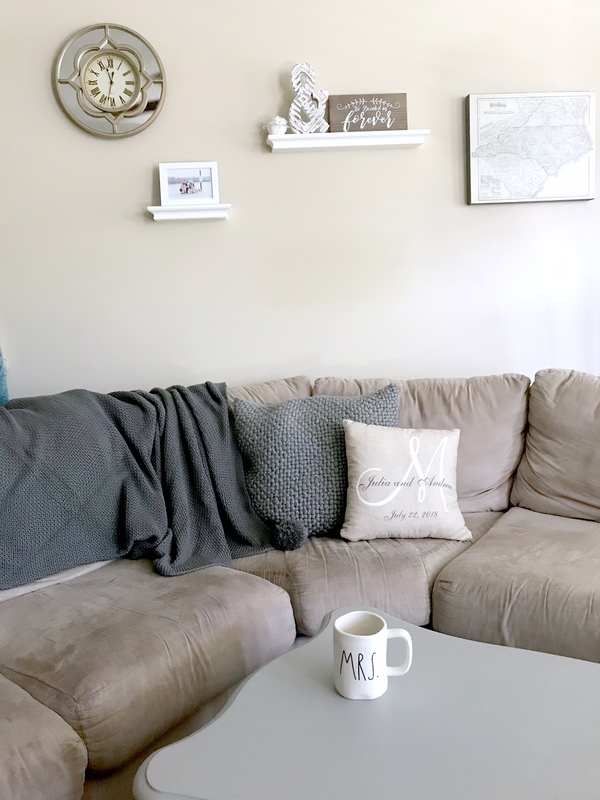 I loved everything I saw, especially that it is a family owned business, so finally I reached out to one of the owners of the company to see what her suggestions would be for products to try! I love to read reviews and take trusted recommendations from people who know what they’re talking about. She suggested several items including their face oil set, but I had just started using another face oil so I had to try something else. 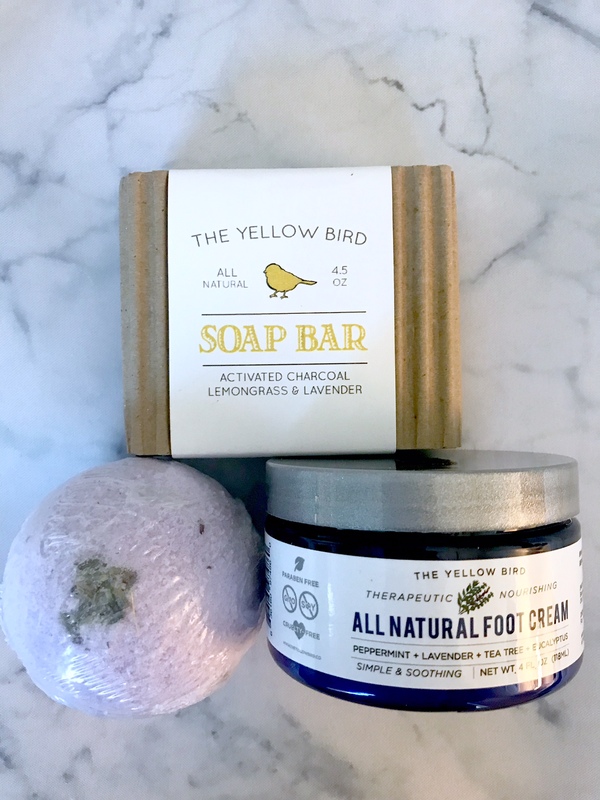 I ended up ordering the activated charcoal soap that comes with the face oil set, and I ordered two of their new bath bombs and this foot cream. I was so impressed with how fast this shipped and got to me, even over the weekend! When I opened the box, the most divine smells filled my room almost immediately. Andrew walked in and asked if I had sprayed some smelly stuff in the room! I loved the scents of the bath bombs. I also love that the charcoal soap has lemongrass and lavender, two of my favorite relaxing scents. When I use it, my face feels squeaky clean, soft, and all my makeup comes off really easily. And I love the smell! You can’t go wrong with a bath bomb, but these are so pretty, fragrant, and left my skin feeling so smooth and soft when I got out of the bath. The foot cream is the real MVP. It’s winter, and my skin is dry everywhere, but my feet and hands tend to suffer the most! This foot cream not only smells so fresh, but I woke up with baby feet that were so soft! It’s not a cream like a lotion – it’s more like an oil or a vaseline type of consistency. I slathered it all over my feet and put on my socks before bed. Wonderful results! And with eucalyptus, lavender, tea tree oil, and peppermint, you can’t go wrong! This post was not sponsored and I truly just love to share trusted recommendations for anyone out there who can benefit from them. The owner of this company was so incredibly kind through our messaging, plus she used to be a teacher too! 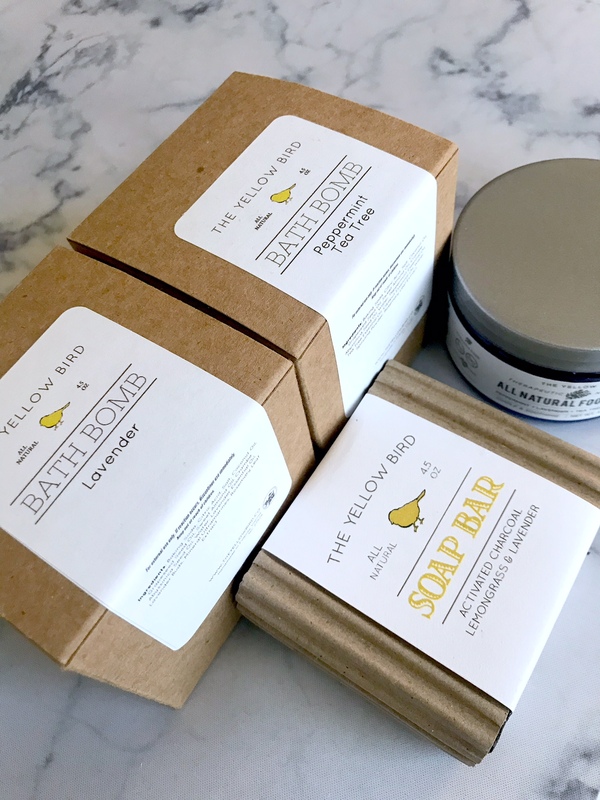 If you’re in the market for some all natural, made with care skincare and bath products that will help support a family, this is a wonderful non-corporate option. Treat yoself, get a nice gift for someone else, stock up on your bath supplies or skin care items, and support a small business owner! I am dying to try the charcoal salt & sugar scrub next, and when my current face oil runs out I’ll give theirs a try!